Maybe you’re getting tired of hauling yourself (or your children) over the wall of your above ground pool. Maybe the ladder you have right now keeps floating away or is just wobbly enough to make you nervous. Whatever the reason, you find yourself in need of a new way to get in and out of your pool. In order to find the best choice among the many above ground pool ladders available, take a few minutes to consider what will best suit your pool and your needs. Learning what to look for will not only allow you to make a smart buying decision, but also help keep your family and friends safe as they enter and exit your pool. How tall is your pool? What surrounds it? Grass? A deck? Do you have any particular physical concerns for those who use your pool? All of those factors and more will help determine what kind of above ground pool steps you need. The type of pool landscaping you have can dictate the type of steps you need. With a deck, you only have to worry about a ladder on the inside of your pool. If you do not have a deck, you need to consider both the inside and outside entry and exit methods. For instance, would you rather climb up steps to get in, or climb down a ladder when you’re coming out? Or do you need steps on both sides of your pool wall to make things easier and safer for your swimmers? In order to function properly and be safe for swimmers, any kind of above ground pool steps you get need to reach from the top of the pool all the way to the ground. And if the ladder you get is too tall for your pool, you’ll have a precarious situation on your hands. Both of those missteps can be avoided by making sure you know your pool’s depth. 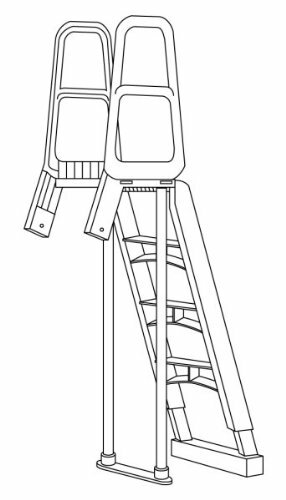 This will correspond to the height you need for your new steps or ladder. We highly recommend removing submerged steps when you winterize your above ground pool. More importantly, many manufacturers recommend doing so. Those steps may have been fairly easy to submerge in your pool, but they’re going to be heavier coming out of the water. When choosing an above ground pool ladder, make sure it’s heavy enough to be sturdy, but light enough that you’ll be able to remove it from the water without injuring yourself. Getting into your pool is usually going to be easier than getting out. After a couple of hours of swimming and splashing, you and other swimmers may be fatigued, and it can be more difficult to lift yourself out of the water. So the ease of getting out (and yes, getting into) your pool is especially important if you don’t have a deck around your pool. If you have youngsters who are still mastering their dog paddle, steps on both sides of the pool will give them more options to enter and exit, plus provide safe spots to take a break from swimming. The same goes for water-loving grandparents. Also consider whether you want your above ground pool ladder to have a gate. Installing a barrier of some kind can help prevent young children from wandering into your pool unattended. This could be in the form of a gate that closes off the bottom step, or a ladder system that can be removed and locked away when the pool is not in use. It’s Durable, But Can You Clean It? 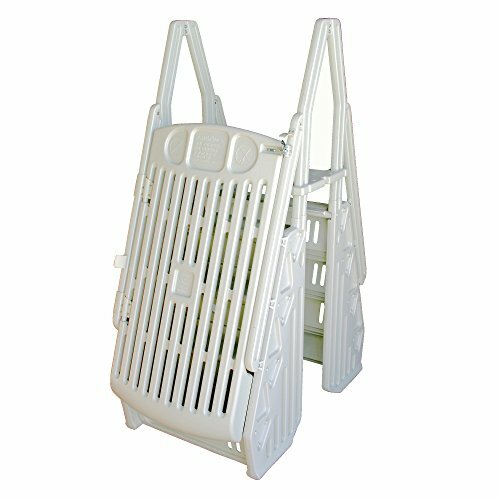 You’ll find most above ground pool ladders are made from steel, plastic resin, aluminum, or a combination of two or more of these materials. They each have pros and cons. If you’re looking for a strong frame, steel is your best bet. But it can be heavy, more expensive, and more difficult to maintain if it’s not stainless or galvanized steel. Galvanized means the steel has been treated to prevent rusting. This zinc coating can help prevent rust for up to 50 years, depending on how much rain or humidity you have in your area. Be sure to clean galvanized steel with a mild cleaning product If you click this link and make a purchase, we earn a commission at no additional cost to you. , something that won’t damage the coating. But before you apply anything, refer to the manufacturer’s instructions for care and maintenance of a steel above ground pool ladder. Durable and weather-resistant, plastic resin is a low-maintenance material for above ground pool steps. If the owner’s manual doesn’t specify any cleaning instructions, a non-abrasive, plastic resin cleaner If you click this link and make a purchase, we earn a commission at no additional cost to you. will usually do the trick, followed by a thorough rinse. Not as strong as steel, but more stable than plastic and resin, aluminum is often used as the frame or railings for your steps. Aluminum resists rust, but you’ll still need to wash the air-exposed parts with a mild detergent. 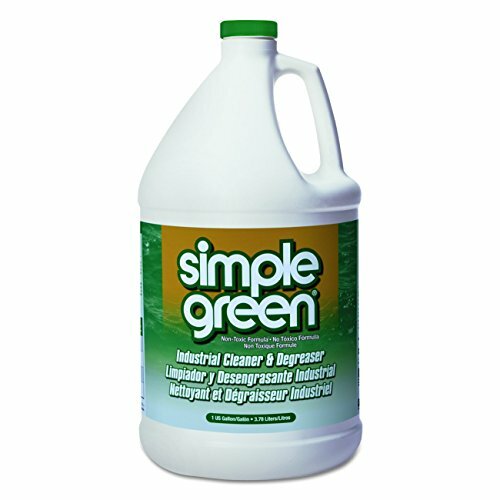 A mixture of dish soap If you click this link and make a purchase, we earn a commission at no additional cost to you. and water works well. Avoid alkaline cleaners as they can cause oxidation, better known as rust. 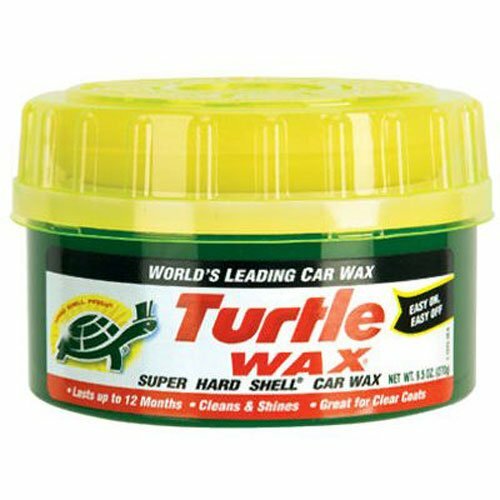 You can also add a light coat of simple car wax If you click this link and make a purchase, we earn a commission at no additional cost to you. to the frame every couple of months during your regular pool maintenance routine. This helps keep your frame clean while preventing unsightly pitting. Before you decide which pool ladder to get, look for key features such as capacity, step width, and ladder height. 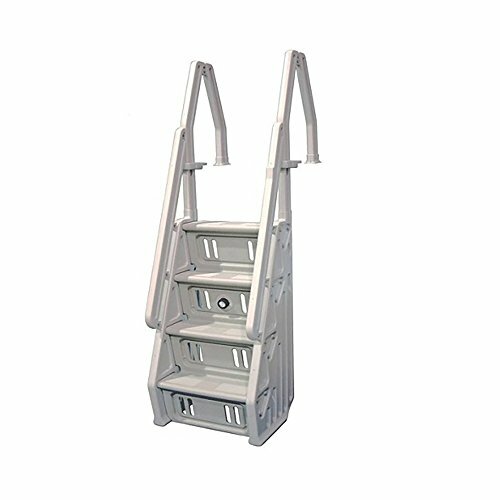 If you’re looking for a heavy-duty ladder with more space, the 400-pound-capacity Confer Above Ground Pool Staircase has extra wide, 31-inch steps as well as two railings for more stability If you click this link and make a purchase, we earn a commission at no additional cost to you. . It works best for pools between 48 and 52 inches high and decks up to 60 inches high. If you don’t have a deck, you’ll need another staircase or ladder for the other side of the pool wall. Important: You’ll need to fill the staircase’s side supports with either sand or pea gravel to weigh it down. If you don’t, it may be a little too buoyant to be safe. Need to childproof your pool? The Blue Wave has you covered. The Simple Step Grand Entry System has a gate that locks If you click this link and make a purchase, we earn a commission at no additional cost to you. at 60 inches high, well out of reach of kids. 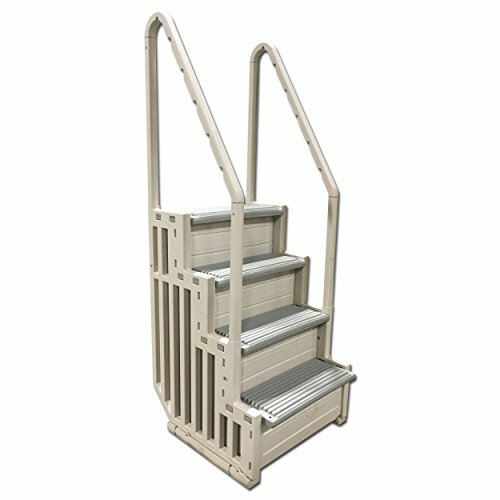 The anti-skid steps are wide for more stability, plus it comes with double extended handrails. The Blue Wave fits above ground pools between 48 and 56 inches tall, with walls as wide as 12 inches. This plastic resin and stainless steel system has a slightly lower weight capacity—350 pounds—but is still a good choice if it suits your needs. 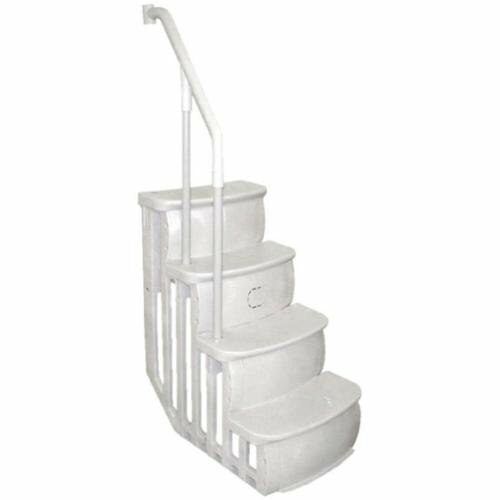 Half staircase, half ladder, the Main Access Comfort Incline system is a less expensive option If you click this link and make a purchase, we earn a commission at no additional cost to you. with the benefits of a ladder (taking up less of your swimming area) and the comfort of steps (a less steep incline). Easily combined with other step or ladder systems if you don’t have a deck, this ladder is a flexible option for your above ground pool. The steps are large with graduated treads for a more stable surface. It’s also easy to assemble and can adjust to fit 48- to 54-inch pools. If you’re not really the DIY type, the Blue Wave Simple Step might be the best option for you. Assembly is literally a snap, and you don’t have to drill into your deck If you click this link and make a purchase, we earn a commission at no additional cost to you. or attach the steps directly to your pool wall for use. Best for 48 to 54 inch above ground pools, the Simple Step needs about 40 pounds of sand to be properly weighted down. Still, that’s a small price to pay for not having to break out any big tools to winterize or open your pool. Better suited for above ground pools with decks already installed If you click this link and make a purchase, we earn a commission at no additional cost to you. 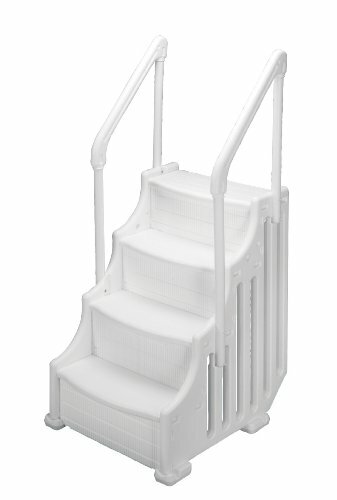 , the Smart Step from Main Access fits 48- to 54-inch pools. At just 24 inches wide, the steps are a little more compact than other brands and models. The backside of the steps is protected from curious little swimmers with thick rails that allow for water flow. Supporting up to 300 pounds, the Vinyl Works In-Step Ladder is probably closer to a step ladder than an actual ladder. The double railings are steep and not as tall as other models. Made with stainless steel hardware and plastic resin, it’s sturdy yet simple to maintain If you click this link and make a purchase, we earn a commission at no additional cost to you. . The ladder can work for pools between 46 and 60 inches tall, though you may need to buy some extra hardware to properly connect it to your deck. Don’t be fooled—no actual cake is involved in these steps. 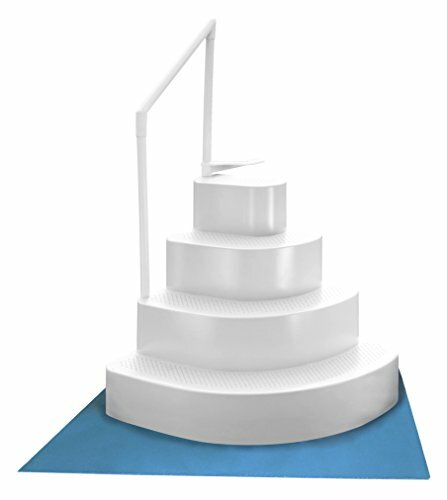 The tiered Blue Wave Wedding Cake Steps can add a little decorative touch to your above ground pool without the extra fuss of permanent steps. This step unit will probably work best if you have a deck and a 54-inch high pool, at the most. The steps are perforated for better traction, and the system is ventilated to prevent algae growth. Handling up to 500 pounds If you click this link and make a purchase, we earn a commission at no additional cost to you. , it’s a potential lounging area for both parents and grandparents. It even comes with a liner pad to prevent scratching in your pool. No deck? No problem. 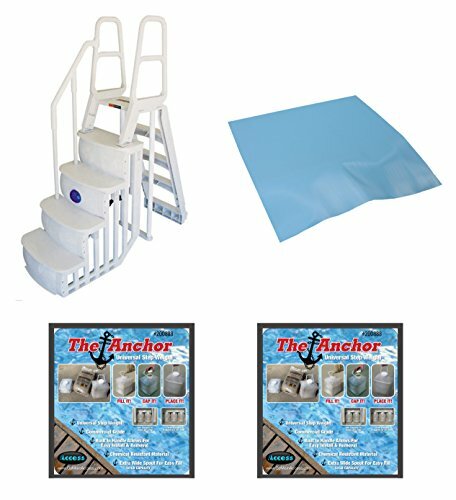 This complete system from Main Access comes with steps, a ladder, a mat to protect your pool, and two watertight sand weights. It has a flow-centric step design, with an additional area under the stairs to keep the weights out of the way. It fits 48- to 54-inch pools If you click this link and make a purchase, we earn a commission at no additional cost to you. , and can accommodate up to 300 pounds. It may be tempting to just prop a stepstool up against the side of your pool, and call it a day. But in the interest of safety, and yes, aesthetics, your better bet is going to be above ground pool steps or a sturdy ladder. Just find the one that not only fits your pool, but your lifestyle, and you’ll feel much better friends and family making that their way into and out of the pool. It’s a small investment that will make a big difference for everyone.